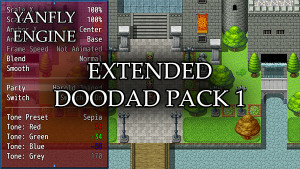 Here are some plugins made for RPG Maker MV, a piece of software that lets you create your own role playing games for the PC, Mac, and various mobile devices! 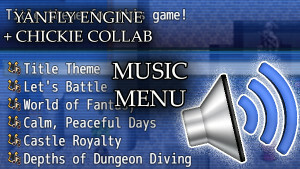 Keep in mind that these plugins are made for RPG Maker MV only! They do not work on other RPG Makers. 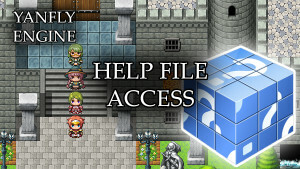 How to Install Plugins – New to RPG Maker MV and want to learn how to install plugins? Click here! UPDATING PLUGINS – Not all plugins placed here are perfectly made. They get bugs from time to time. 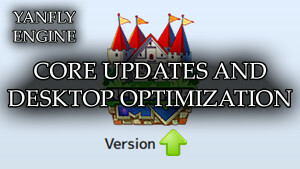 Visit this link to learn how to update plugins and to see which plugins need updating. English Links – If you prefer grabbing the plugins from an easy directory tree, here it is! It is highly recommended that you place these plugins in the order shown below. 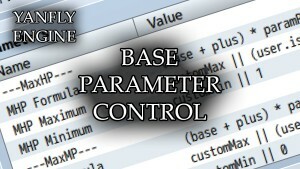 These are plugins that affect the core aspects of your game, ranging from basic limitations to messages and even menus. 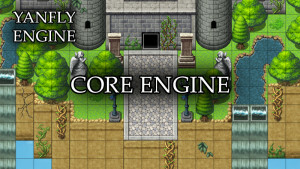 The Core Engine plugin is a plugin that’s made to address the core aspects of your game project, from raising the limits of stats to changing the colors of your window objects. 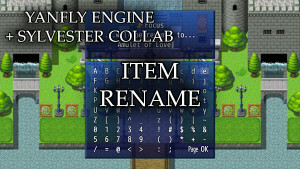 Also to be included with this plugin will be any bug fixes made for RPG Maker MV. This plugin will be periodically updated whenever there is a new bug that is fixed. Yanfly Engine Plugins’ Core Engine is not a requirement for the plugin library to work. Does your game project have at least base code (rpg_x.js) 1.4.0 or above? And has RPG Maker MV updated past that, but you don’t feel like updating the base code manually, probably because you’ve made some edits to the code itself? Yet, you still want to take advantage of the changes from the version ups? This plugin will take care of that for you while keeping your base code intact, while ‘patching’ the changes made from higher version ups. This plugin also adds in the updates and new functions from the versions leading up to 1.5.2 to ensure that your project has the most up to date functions even if it is running 1.4.0. This way, you do not have to tamper with the game project’s base code files yourself. 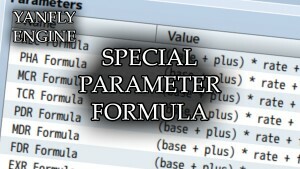 The values for the Extra Parameters: HIT, EVA, CRI, CEV, MEV, MRF, CNT, HRG, MRG, and TRG, in RPG Maker MV are only able to be ever modified by traits by the various database objects. 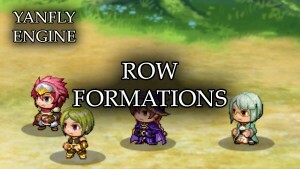 While it is flexible, RPG Maker MV does not enable you to utilize custom formulas to make things such as ATK and AGI influence HIT rate or LUK influence CRItical hits. With this plugin, now you can along with a few more goodies! For those using custom fonts, you may have noticed that not all fonts from the /fonts/ directory are loaded at the time the game is loaded. 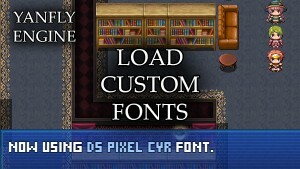 This plugin let's you place the fonts into the /fonts/ directory and then load them as the game starts. 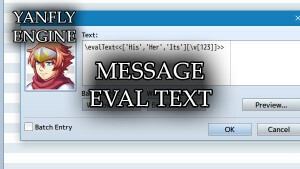 The Message Core plugin adds more functionality to the default RPG Maker MV message system, enabling more text codes, a name box, and adjustable message window sizes! 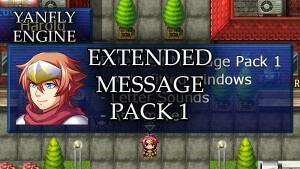 This plugin extends the amount of things the Message system can do in RPG Maker MV. These features range from text sounds, more name window options, face index control, hex colors, extended choice controls, and more precise window positioning control. New text codes are also added to further ease the usage of the message window. 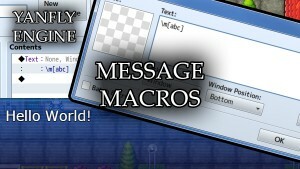 This plugin makes use of text codes to deliver vital information to the player. 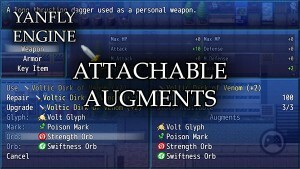 It can deliver the amount of items, weapons, and armors in the player’s possession to the various parameters, extra parameters, and special parameters for actors and enemies. The new text codes also allow you to change the text color based on two number comparisons for conditional ways to color your text. In addition to conditional colors, text can also be displayed based on switch values or custom conditions. 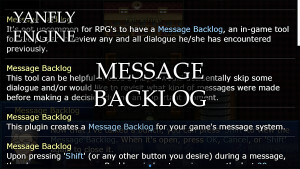 It’s not uncommon for RPG’s to have a message backlog, an in-game tool for the player to review any and all dialogue he/she has encountered previously. This tool can be helpful in case a player would accidentally skip some dialogue and/or would like to revisit what kind of messages were made before making a decision during an important moment. 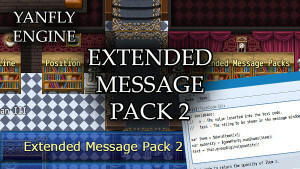 This plugin creates a message backlog system for your game’s message system. Upon pressing ‘Shift’ (or any other button you desire) during a message, the player can open up a Backlog window to review over the last 20 encountered messages (number of stored messages can be modified within the parameters). These saved messages can also include any choices from the choice lists they have selected, any numbers they may have inputted, or items they selected from special events. Now, your players can go forward, knowing full well they have little to worry about in case they’ve missed any messages. 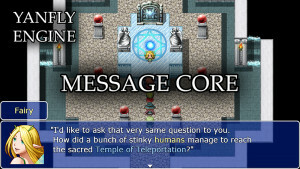 The option to control the message speed is quite common in RPG's nowadays. Players can put in whatever option they feel like for the text to go at, or if they wish, to have the text display instantly! 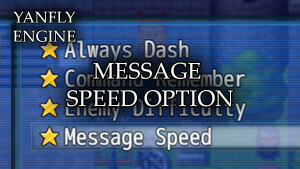 This plugin will add in the 'Message Speed' option into your Options Menu for players to adjust! It comes with speeds from 0 (slowest) to 10 (fastest) and even an "11th" speed of being instant! 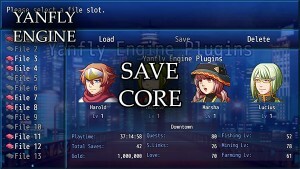 This plugin provides a new save interface for the player. Along with a new interface, the player can also load and delete saves straight from the menu itself. 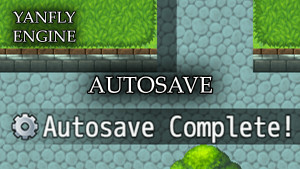 This will in turn make the save command from the Main Menu always available, but the save option within the new save menu will be enabled depending on whether or not it is allowed or disallowed. 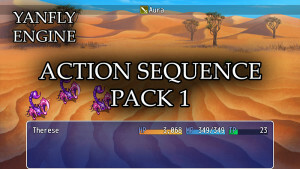 From the interface, the player is given more information regarding the save file including the the location the player saved at, the amount of gold available, and any variables that you want to show the player as well. 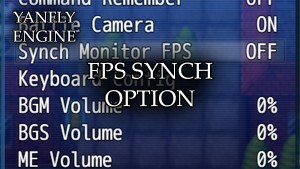 RPG Maker MV comes with Self Switch functionality. However, the number of Self Switches provided is a mere 4 in total, not enough for some of the more complex events. 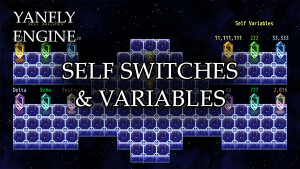 This plugin will let you extend the number of Self Switches. Self Variables, on the other hand, do not exist in RPG Maker MV, so this plugin will provide functionality for that as well. 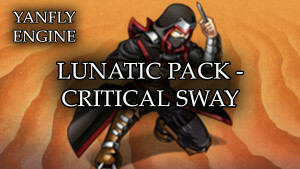 These plugins alter the battle engine’s aspects from the basic core engine to action sequence packs and more! 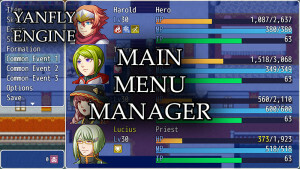 The default battle system for RPG Maker MV now allows for the ever so popular side-view! However, we can beef it up a little bit more using the Battle Engine Core to add more features and capabilities to the battle system! 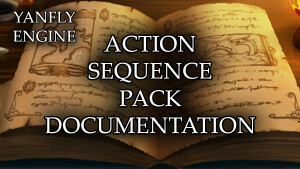 The third action sequence pack for this set includes the ability to control the camera and zooming! Use these action sequences provided by this plugin to make your actions look nice and flashy! This plugin requires Battle Engine Core. 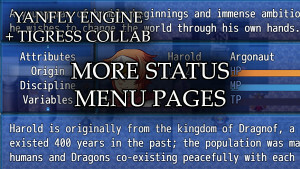 Not a plugin but compiled and detailed documentation made by the various users of the RPG Maker community! 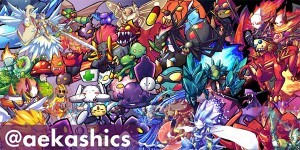 The ever so popularly requested battle system: ATB! Made similarly to match the Final Fantasy series, the ATB system starts off with your characters filling up their gauges before they can input an action. Once an action is inputted, they start to quickly charge it up before going to perform their attack. 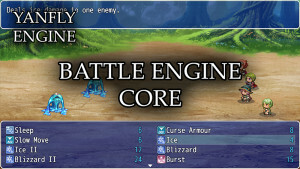 This plugin requires Battle Engine Core. WARNING: Support for ATB has bee discontinued by Yanfly. You can read about it here. You can continue using it, but do not expect everything to work with it. 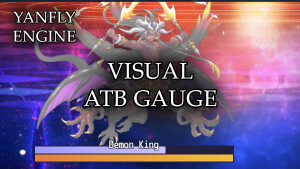 For Yanfly Engine Plugins – Battle System – ATB users, you can now display ATB gauges for your enemies! This plugin is plug and play but it does require the YEP_BattleSysATB plugin. 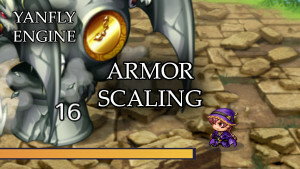 The gauges can be shown either below or above the enemies. This plugin requires Battle Engine Core. The fabled Battle System – CTB! 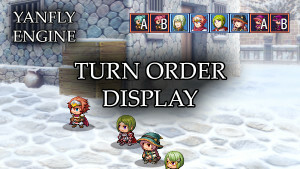 Battle participants are placed in a visible turn order based on their agility and speed. When it becomes their turn, they input an action and execute it immediately, then proceed back in line. The CTB system focuses heavily on turn manipulation to change the strategic flow of battle. WARNING: Support for CTB has bee discontinued by Yanfly. You can read about it here. You can continue using it, but do not expect everything to work with it. 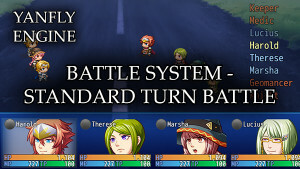 The Standard Turn Battle system functions off of the Default Turn Battle system’s structure. 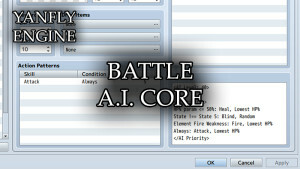 Action orders are determined by the battlers’ AGI values and they go from highest to lowest. However, actions are not selected at the start of the turn. Instead, the turn progresses and the actions are picked as each battler’s turn appears, then proceeds to be executed immediately. 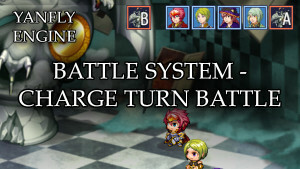 Each battler is only allowed one action per battle turn, meaning a single battler cannot have twice the number of turns as another battler even if the battler’s AGI value is double that of the other. This is to prevent any balancing issues that come from tick-based battle systems as they tend to be far more difficult to balance compared to turn-based battle systems. 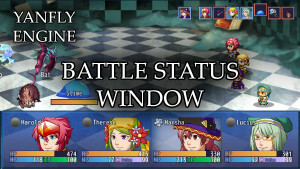 In battle by default, there’s no way to check your party’s status. This plugin will add a new ‘Status’ command to the Party Command Window (with Fight and Escape) to allow players to check party members. 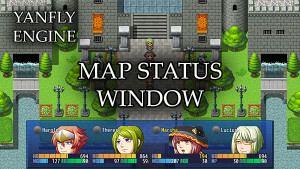 Here, the player can view each party member’s current parameters, get a list of all states, buffs, and debuffs. 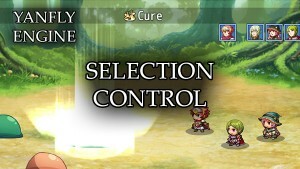 The player can scroll through the list and view newly added help descriptions of the states, buffs, and debuffs in a help window. 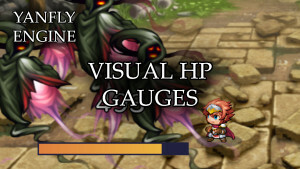 Want to display HP gauges visibly on enemies? And possibly even your allies? Want to give certain enemies different color HP gauges or make it longer than usual? 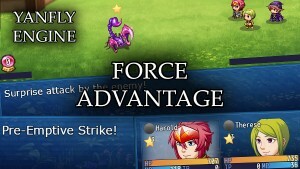 Or make it required that enemies must be defeated first before showing their HP gauge? Well, now you can! 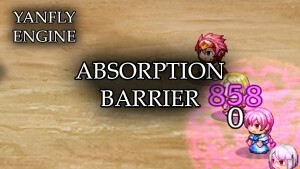 The Absorption Barrier is a new mechanic added for battle. Barrier Points, a new type of stat, provide a layer of protection for battlers. 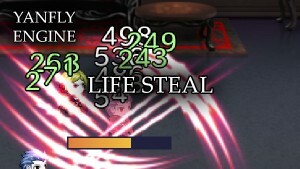 Any direct damage that would normally be done to HP would be dealt to the battler's Barrier Points first, mitigating any real damage dealt to the battler. 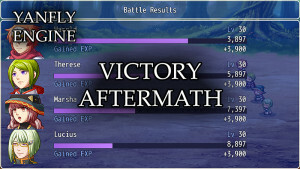 Any remaining damage is then dealt to the battler. Tired of dumb enemies that turn your otherwise challenging game into an easy-peasy walk in the park? The Battle A.I. Core plugin allows you to manually adjust the settings and patterns of your enemies so that they can deliver MANLY poundings onto your players. Battle A.I. 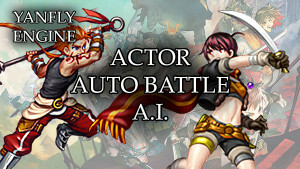 Core >> Actor Auto Battle A.I. 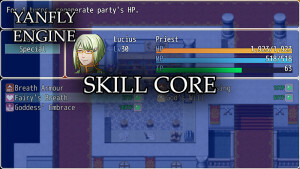 By default, if an actor has the auto battle trait, it will cycle through each one of its learned skills (whether or not it has access to the skill type doesn’t matter) and selects the hardest hitting skill of them all. This setup may work for some auto-battlers but not all of them. What this plugin does is it incorporates the A.I. Priority system from the YEP Library’s Battle A.I. Core for actor auto-battlers. 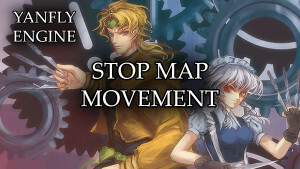 This plugin lets you assign certain BGM's to certain troops so that they will play from the map transition into the battle. 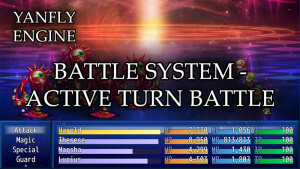 Furthermore, when a major enemy's HP is reduced to certain values, the battle BGM can change as well. 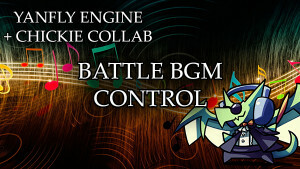 This will help add extra feeling to the battle and make battle BGM's less monotonous for longer battles. 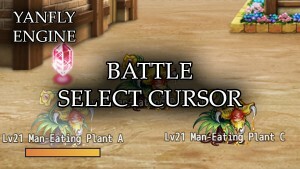 This plugin allows you to set custom cursors when selecting allies and/or enemies for targeting while in battle. This is to help with better visual cues when picking a target if the flashing battler isn't enough. 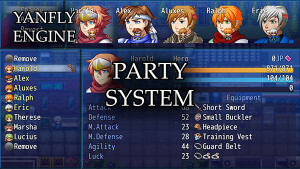 This plugin replaces the default battle status window, which was shown in a row format, to a column-based format that also displays the party's faces. 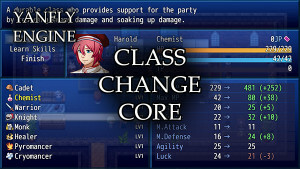 Alter the basic mechanics behind buffs and states that aren't adjustable within the RPG Maker editor. 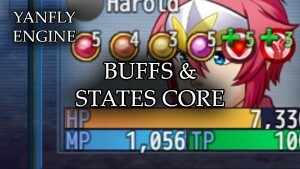 Such mechanics include altering the maximum number of times buffs can stack, changing the turns remaining on buffs and states, and the rules involved when reapplying states. 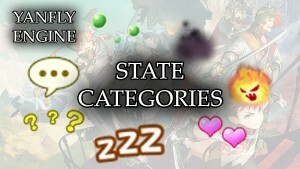 This plugin allows you to set categories for your states. They can be one category, multiple categories, or no categories. With this in mind, there's a few new features this plugin provides that pertains to this category system such as removal of states under a certain category and the ability to have them bypass certain key removal aspects such as on Death removal or Recover All removal. For those running a Tick-Based Battle System with the Battle Engine Core (ie. 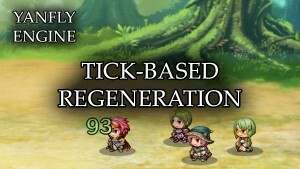 Active Turn Battle or Charge Turn Battle), this will automatically set your states for Turn End timings to use a Time Based system, but in turn, causes regeneration effects to occur individually. 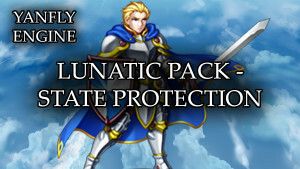 This plugin allows you to add a variety of protection effects to your states to allow them to reduce HP or MP damage in more unique ways, from cutting off a percentage of the original damage, blocking off damage entirely once certain break points are met, capping damage in certain ways, and surviving fatal damage. 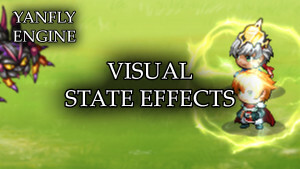 And should any of those effects trigger, you can set the state to perform special effects, too! Figuring out the right amount of defense values to give your actors when using the Armor Scaling plugin can be a challenge. 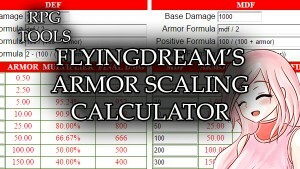 This tool will allow you to test various defense values to see how armor scaling will affect different base damage values to help assist you in figuring out how to make armor scaling work right for your game. This plugin allows you to modify the critical hit rate formula across a global scale and for an individual skill/item scale. This plugin requires Damage Core. 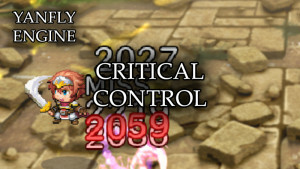 Elemental control in RPG Maker MV is pretty lacking. The calculation of how multiple elements are handled aren't very clear nor are they too intuitive when it comes to certain aspects. 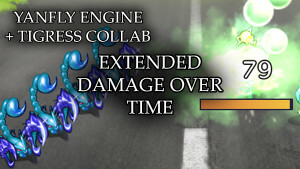 This plugin also gives way to skills and items having more than one element, battlers being able to absorb, reflect, amplify elemental damage, and more! 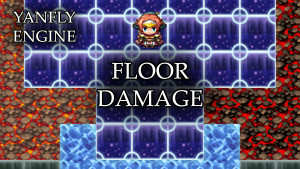 By default, RPG Maker MV limits enemies to only drop up to 3 items max and at very limited drop rates. This plugin allows you to add more than 3 items at drop. 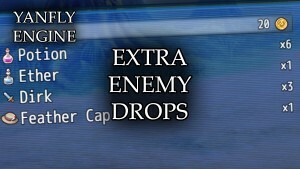 In addition to having more than 3 drops, this plugin also allows you to expand the enemy drops to have conditional drops, drops that will only appear before the player if certain conditions are met. 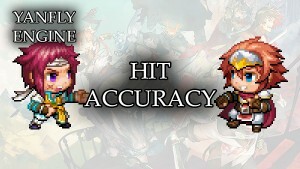 By default, RPG Maker MV’s action accuracy formula is unintuitive. For what it matters, the accuracy of the skill is determined first, then the evasion of the target is determined second regardless of the accuracy of the first check. 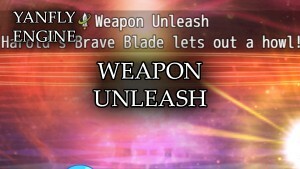 This means that even if an attacker has 1000% HIT accuracy, the skill can still be evaded by the enemy’s 5% EVA stat. 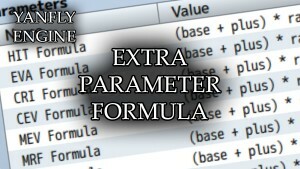 So instead, this plugin will provide control over an action’s accuracy formula and evasion formula. By this plugin’s default settings, accuracy will now be calculated where the attacker’s HIT and the enemy’s EVA are set against one another for a more intuitive accuracy formula. Different types of armors make different sounds when they’re hit. When an actor is struck by an attack and takes damage, they will play a sound effect based off the armor they are wearing (ie. cloth versus metal). 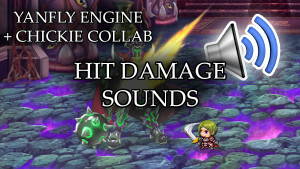 Enemies can also play different sound effects when they get hit, too (ie. slimes versus robots). Use this plugin to make your armors and enemies more lively when they react to damage. This is a collaboration plugin by Chickie and Yanfly to ensure compatibility with the Yanfly Engine Plugins library. 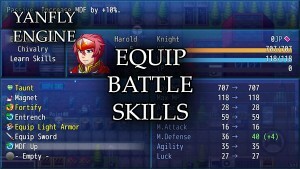 Life Steal is a mechanic in RPG Maker MV that only exists in the form of specific skills or items. There is no way to passively gain Life Steal from physical, magical, or certain hit attacks. This plugin will allow you to set passive Life Steal traits for physical, magical, and certain hit attacks for both HP and MP values. 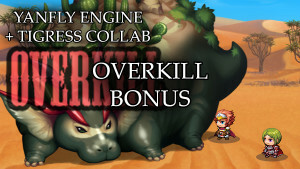 Overkill occurs when an actor defeats an enemy with excessive damage. 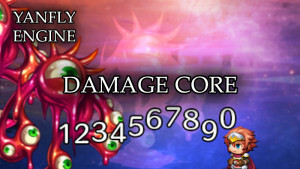 All enemies have an Overkill damage requirement and if a battler lands a killing blow dealing damage equal to or greater than this number, an animation is played on the enemy before the enemy collapses. 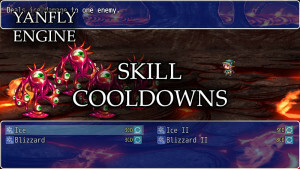 When an enemy is overkilled, that enemy will reward the player with more EXP, more gold, a higher drop rate, and if YEP_ExtraEnemyDrops is installed, more possibilities for extra items under the condition of being Overkilled. 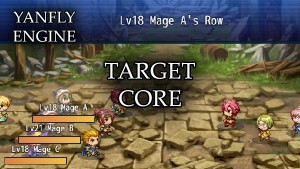 The Target Core plugin is made to expand upon the existing target scopes provided by RPG Maker MV. This plugin enables you to use more target scopes, with a larger variety of ways to target actors and enemies with bonus ways to choose targets combined with the Row Formation plugin. Sometimes, targeting one foe isn’t enough and targeting all foes is too many. 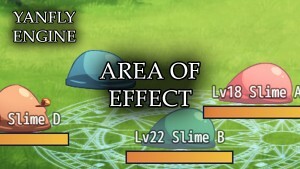 The right mix in between would be area of effects to target only a certain area of foes. This plugins enables area of effect targeting to come in the forms of circular areas, column areas, row areas, and even the whole screen. Taunts have become a mainstream game mechanic for many games. 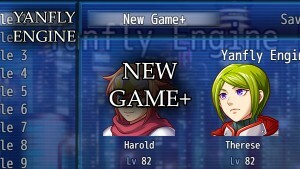 It’s only natural to port something like that over to RPG Maker MV! 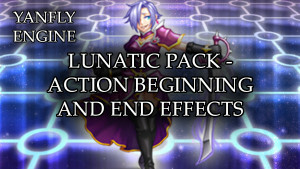 Included in this plugin are taunt effects and taunt nullification effects! 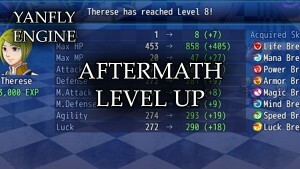 This adds a level up section to the Victory Aftermath sequence to show the individual parameter changes the actor has acquired in addition to skills that the actor may have learned. This segment will be omitted if there are no actors to level up or if the game has the segment disabled. When there are multiple actors leveling up, the Victory Aftermath will cycle through each of the actors. 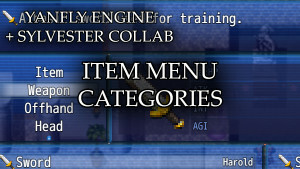 These plugins affect items and the item scene, ranging from independent items to item upgrades to new menu layouts. 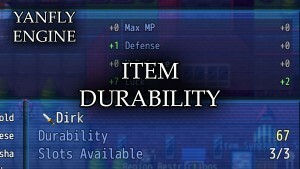 Independent Weapons and Armors will now have a Durability value. Over the course of battle, equipment durability will drop based on actions performed, damage taken, and the like. When a piece of equipment’s durability value reaches 0, the piece of equipment will break. Durability can be repaired by items and increased by skills, too. 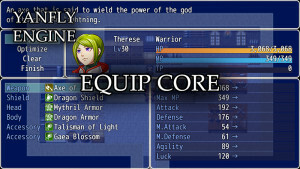 In RPG Maker MV, there exists only four categories seen in the item menu: Items, Weapons, Armors, and Key Items. Adding extra categories wouldn’t be possible without plugins. This plugin, through the help of Item Core, will allow you to add in many more categories in addition to many premade ones that are automatically added based on weapon types, armor types, equipment types, item usage, and more! In games with a lot of items, weapons, and/or pieces of armors being used all the time, simply remembering which one is which can prove to be a hard task for some players. 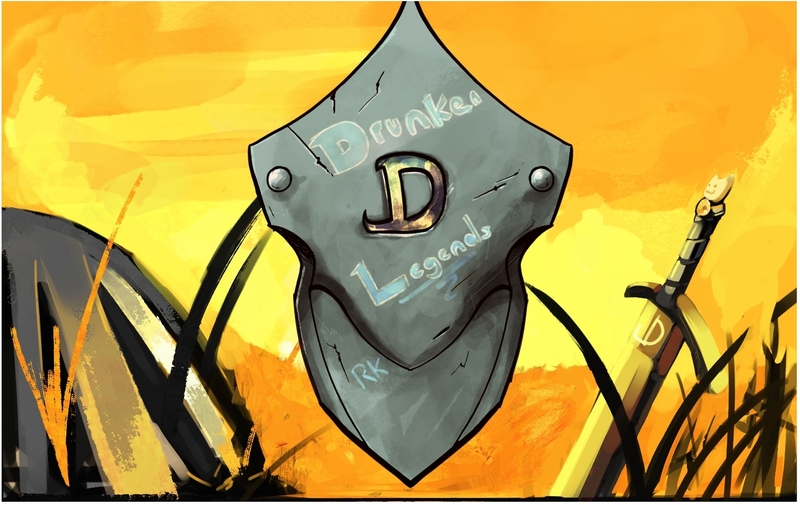 By giving the player the ability to rename the said item, weapon, and/or armor, the player is able to develop his/her own way to commit the object to memory and personalize the object even more. 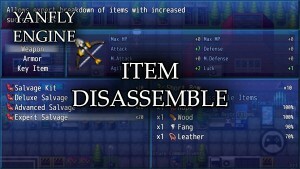 In RPG Maker MV, items only have a few restrictions on them by default, whether or not they can be used in or out of battle or never. 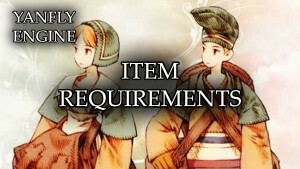 There aren’t any other conditions that you can set that would otherwise determine if an item can or cannot be used. This plugin gives more ways to restrict item usage based on switches, variables, the actors using them, classes, state requirements, and more. This plugin requires the Item Core plugin as this plugin is an extension plugin for it. 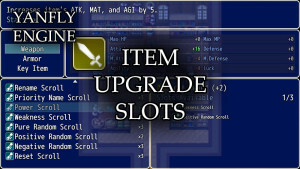 This plugin enables your players to be able to uprade their weapons and armors through a dedicated slot system. 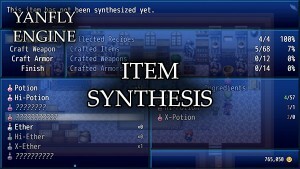 Item synthesis is now a pretty common aspect of most RPG's where the player can craft their own items after acquiring recipes. This plugin enables your players to be able to do that after acquiring the said recipes. Recipes can come in the form of items, weapons, and/or armors and transcribed in them are what items, weapons, and/or armors they can make. 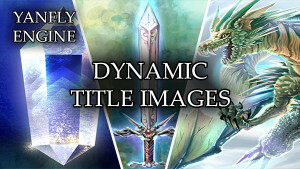 These items can be made from the main menu and/or synthesis locations! 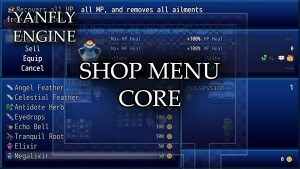 The shop menu in RPG Maker MV is the same as it was in RPG Maker VX and RPG Maker VX Ace. It's relatively basic and provides adequate information, but not really enough to let the player know what they're actually buying or even selling. 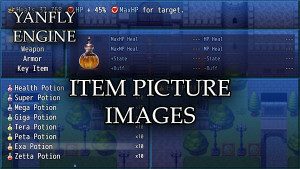 This plugin enables shops to show more than just the basic information displayed in RPG Maker MV and even allows for custom commands to be inserted into the command window. 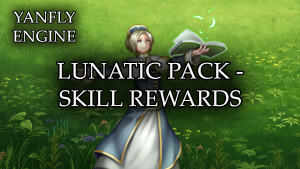 These plugins affect skill usage ranging from skill costs to the way they're handled. 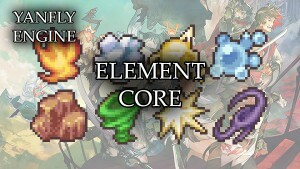 This is an extension plugin for the Skill Core plugin. 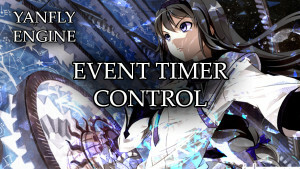 This plugin enables you to set a limited amount of times certain skills (or all skills) can be used per battle or ever. 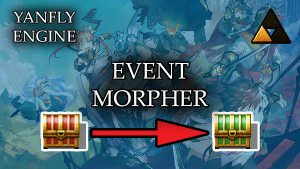 This adds a different type of skill currency and balance mechanic in limiting the amount of times a skill can be used without directly having to alter MP, TP, or the like. 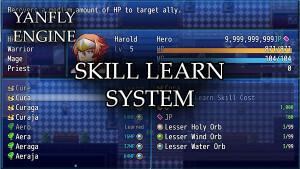 In RPG Maker MV, you can only assign one skill type per skill. 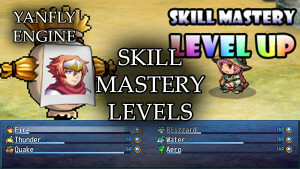 This means that each skill can only appear under one skill type library when scrolling through a skill list. 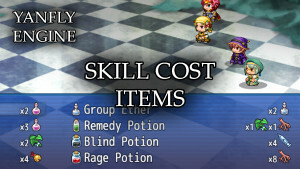 Yet, in traditional RPG’s, we sometimes see skills that can exist in multiple skill types. A “Cure” spell might appear in both “White Magic” and “Red Magic” at the same time. 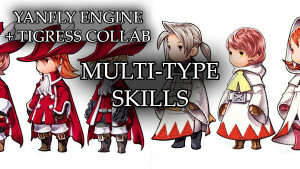 This plugin enables the possibility to give skills multiple skill types. 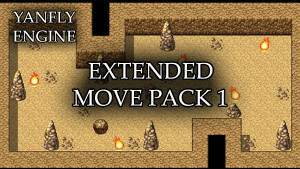 This plugin requires the Skill Core plugin and enables a Party Limit Gauge for both the player party and the enemy party. These gauges will fill up or decrease depending on what actions take place. 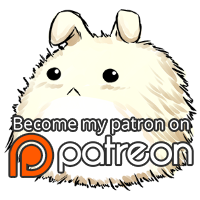 The amounts they raise can be adjusted within the plugin's parameters to your liking. 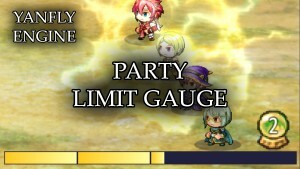 Once a party has enough of the Party Limit Gauge, members from that party can use it as a skill resource to unleash powerful actions in battle! This plugin allows you to add a variety of effects to your items and skills to reward the player for good (or bad) gameplay. Certain effects can only trigger under specific conditions, such as defeating the target, landing a critical hit, or striking the target’s weakness. 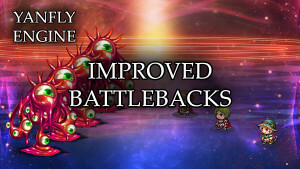 After these conditions have been met, the effects can range from refunding skill costs, adding buffs, removing debuffs, or even applying states. 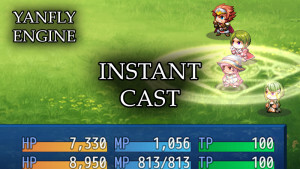 Instant Cast allows for skills and items to be instantly used after being selected without using up the user’s turn! This plugin enables your game’s actors to learn skills from the skill menu. 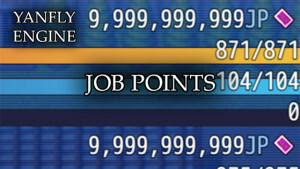 This can be done via either gold, items, or Job Points. 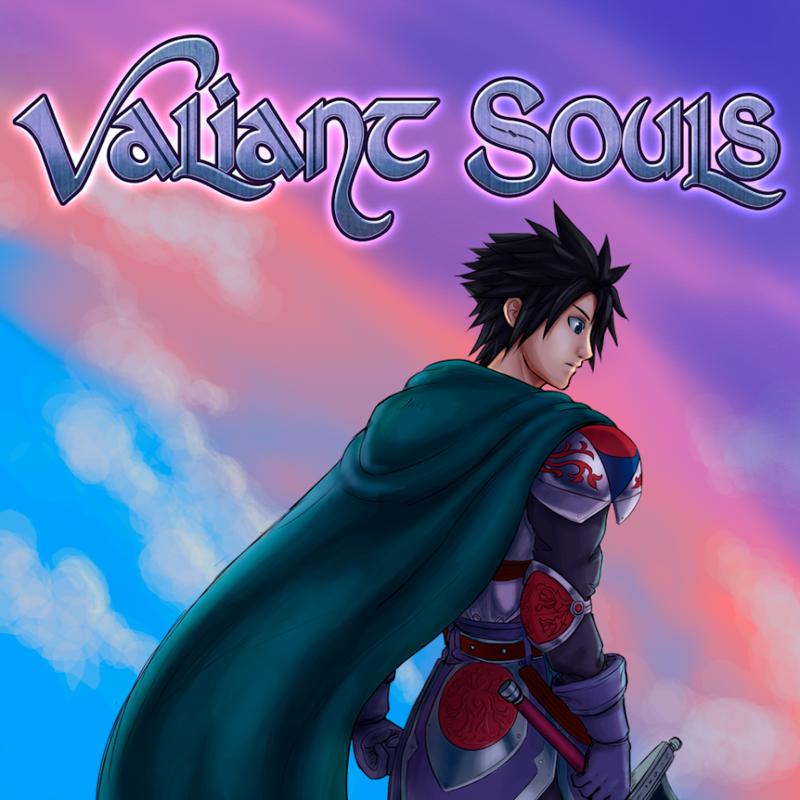 It provides the player an alternate way of acquiring skills aside from leveling up. These plugins affect equipment and the equip menu. 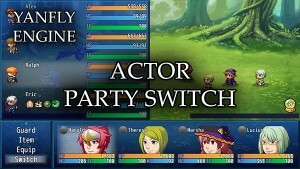 This plugin enables your player to be able to switch out an actor’s equips mid-battle. 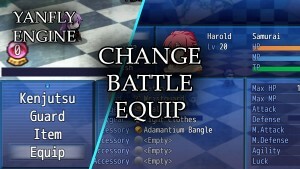 This will take the player to the Equip menu rather than leave the player inside the battle scene. Games that use the YEP_X_ItemUpgradeSlots, YEP_X_ItemDurability, and YEP_X_AttachAugment plugins may notice that it's not too intuitive to modify items from the item menu when they're equipped to the actors in the equip menu. This plugin will add a "Customize" option to the Equip menu that will function as a shortcut to the Item menu for quick customization access. 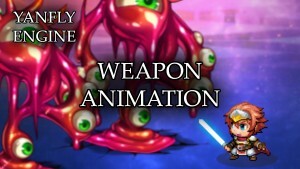 This plugin allows your game to be able to replace the Attack and Guard commands or give them the option of having a skill randomly occur when using them in reference to Golden Sun's Weapon Unleash system! These plugins are made for the status menu and alter the way the status menu appears in your game. This plugin replaces the Status menu with a whole new layout. Including the function to display more information regarding the actor. This plugin requires the Status Menu Core. 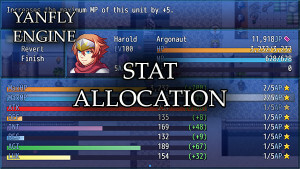 Ever wanted to display unique Game Variables into the status menu to portray your actors? Now you can! These variables can come from a global or individual source per actor. Variables listed in the Global Columns found in the parameters will be listed for all actors. Variables defined in the actor noteboxes will be listed for that actor when displayed. 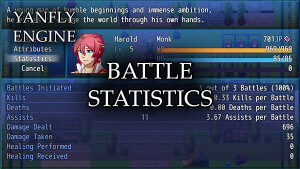 Ever wanted to log the battle statistics of your actors over the course of the entire gameplay? Well, now you can! 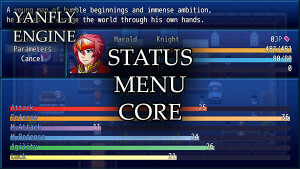 This bonus plugin requires the Status Menu Core plugin. This plugin requires the Status Menu Core. 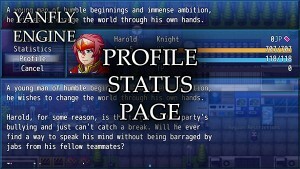 This plugin adds a new 'Profile' command to the Status Menu where the player can read up on the actor's biography. Pictures can be added in. Text can be updated mid-game, too! These plugins affect the entirity of gameplay with their unique changes. Add passive states to your game! They can be innate to actors, classes, appear when a piece of equipment is worn, or after an actor learns a skill! Having a passive state increase gameplay depth by a lot! 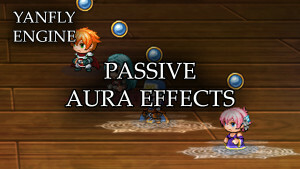 Passive Aura Effects are commonly found in many online multiplayer games with RPG elements. When a battler can give out an aura, it will affect other nearby battlers, too, either ally and/or foe. This plugin will allow states to generate aura effects for other party members, opponents, or specifically for actor and/or enemy parties. 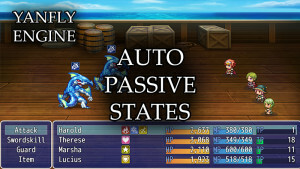 Passive States can be a powerful addition to a game, but if they are always active throughout a battle, they can be a little too powerful. Sometimes, you will want to limit the extent at which your passive states will be active by imposing conditional cases upon them. If all of the passive’s conditional cases have been met, then the passive will become active. 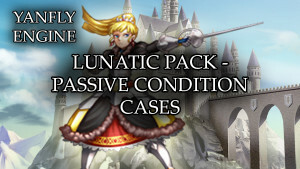 This plugin adds a multitude of conditional cases for you to be able to use in your game and limit certain passive states from having their effects active at all times. 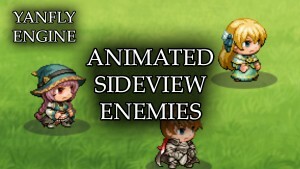 This plugin allows enemies to function off of a leveling system. 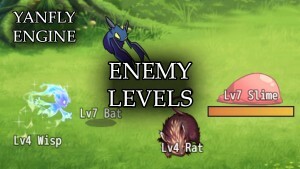 An enemy's level will be increased relative to the player under specific rulings and will increase its stats based on its level. The Enemy Levels plugin can be difficult to balance. 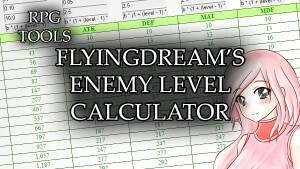 FlyingDream made this wonderful way to calculate enemy stats by various levels using different base values, percent rates, and flat amounts to help you see the variations across different levels! 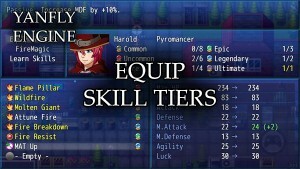 Sometimes, players would like to be able to increase or decrease the difficulty of your game at their own accord. 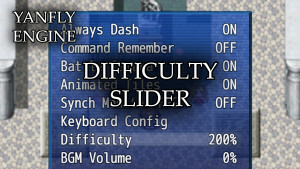 The Difficulty Slider becomes a feature accessible from the game’s option menu with this plugin installed. 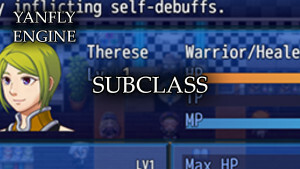 There, the player is able to alter the level of the enemies that appear in battle within a certain range (set by you, the developer). 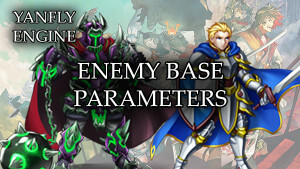 For those who would like a more formulaic approach to the way to calculate enemy parameters similar to how Class Base Parameters does it, this plugin will allow you a similar way to determine enemy parameters. 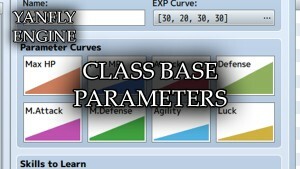 This can be used to base enemies off of player class stats or even to fine tune each enemy’s own individual stats. 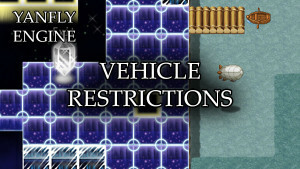 The TP system in RPG Maker MV is rather limiting. 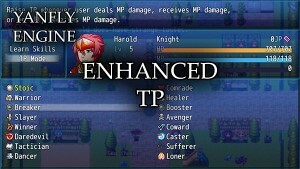 A lot of the TP system is hardcoded in giving RPG Maker MV users very little control over how much TP gain a battler can receive from particular actions and situations. 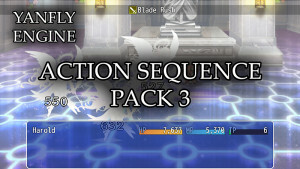 This plugin gives you the ability to adjust how much TP battlers will acquire from various actions, different TP modes, and letting players select and pick what TP mode they want for each actor. This is an extension plugin for Enhanced TP. For those who think that 20 TP Modes isn't enough, this will expand the amount of TP Modes for your game by another 20 for each up to a total of 100 TP Modes! 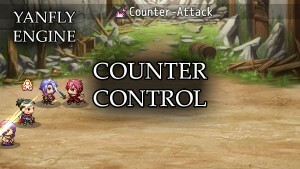 For those who are using the Equip Battle Skills plugin, you may have noticed that the 'Skills' command replaces all skill types in the battle command window. For those who'd like to have certain skill types continue working, you can use this plugin to create an exception for it. 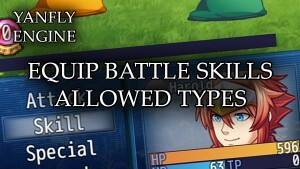 The skill types found listed in the plugin parameters will be given an exception and will be shown in battle. 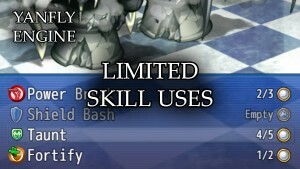 Any skill that contains the skill type also cannot be equipped in a battle skill slot. 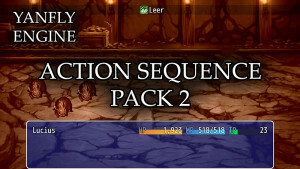 This plugin by itself will not change any major game functions, but instead, it works in combination with other plugins that make use of this plugin’s functions should you decide to incorporate Job Points into your game. This plugin places party members into row formations to give them distinct advantages based on row location in the form of states for maximum control. Skills and items are capable of moving targets to different row locations. 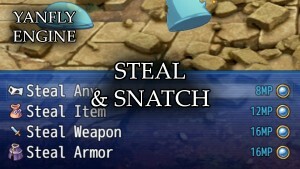 Stealing is a commonly used mechanic found in many traditional RPG's. This plugin enables you to replicate that mechanic and add more depth upon it. These plugins affect movement behaviors for events and/or the player on maps. 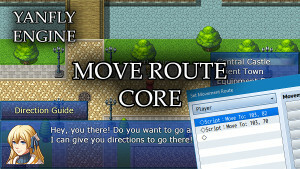 RPG Maker MV gives us a lot of various commands to use for our Move Routes. However, it still imposes a lot of limitations on the system for what else could still be potentially useful for move route commands. This plugin will provide additional methods to construct move routes for your events and allow you to streamline the move route creation process. Use Quests in your game! This plugin adds a new window to the map scene: a Quest Window to display whatever quest is currently active and its unfinished objectives. 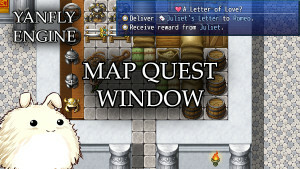 This way, the player can conveniently look at the needed quest objectives that are needed to be completed. 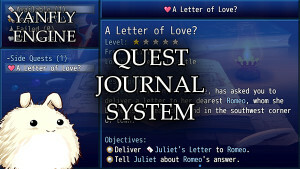 The player can also set or clear the currently active quest from the Quest Journal System menu. 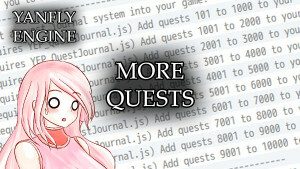 By default, the YEP_QuestJournal plugin comes with 100 quest entries that you can make and insert into your game. 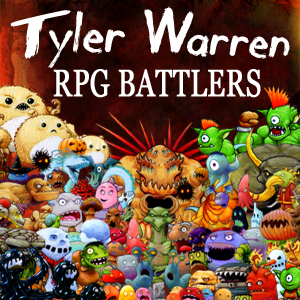 And depending on the RPG being made, 100 quest entries just might not be enough. 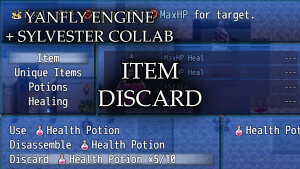 This plugin is a part of a series of extension plugins made for the Yanfly Engine Plugins Quest Journal System to allow for a higher quest quantity than just 100. The Options Menu can be the one thing that can change how comfortable a player is with your game. 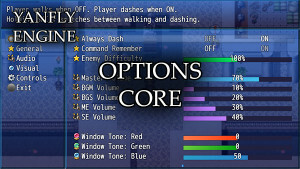 Within the Options Menu, the player can alter any given settings to their liking adjusting to their playstyle. 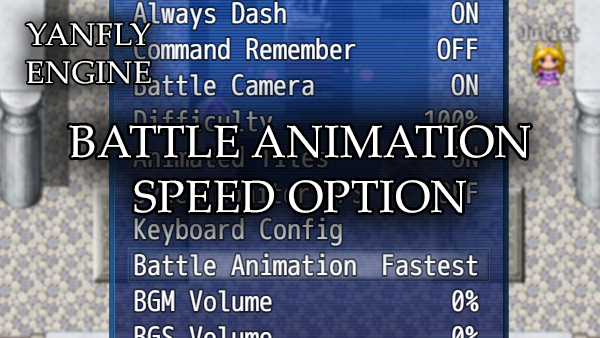 By default, settings like 'Always Dash' and 'Command Remember' are included in RPG Maker MV and other plugins made for RPG Maker MV may also add in newer options to the list. However, the menus themselves were always a bit iffy to look at and/or adjust. This plugin gives the Options Menu a visual makeover and full control over what options can be added to the menu to befit your players! Some players may experience lag when walking near animated tiles. This is due to the fact that animated tiles constantly draw, delete, and redraw the tiles every few frames. Unfortunately, due to Pixi2's drawing method, there exists some memory leaks when this kind of drawing occurs. On mobile devices or weak computers with little memory to spare, this can potentially cause some games to crash. 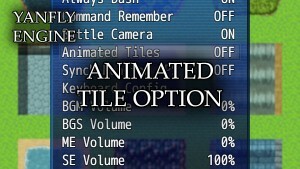 The option to enable/disable animated tiles is now in the options menu for players to toggle. 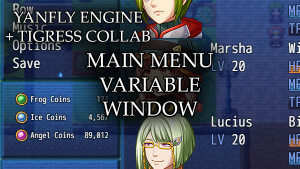 RPG Maker MV is constructed in a way where each update to its engine is done once per frame update. While this is normally fine, as many players view the game through 60 fps, some players experience the game differently as their hardware may run at higher than 60 fps. 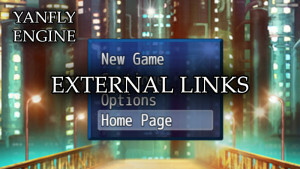 This plugin adds the option in the Options menu for players to choose the setting they want. These plugins are made for expanding the eventing system. Grants your player the ability to go Stealth Mode for either a limited set amount of time or an unlimited amount of time. 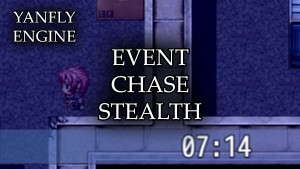 While in Stealth Mode, the player will not alert any events set by the Event Chase Player plugin. This plugin also includes region areas that are considered stealth regions. 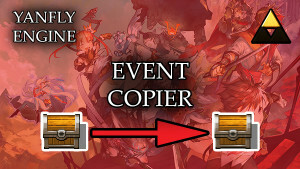 Have you ever made an event template to copy and paste from? Good. That’s an efficient way to go about reproducing events that are repeatedly found in your game. But have you ever decided that you suddenly want to make a change to that event… after you’ve copied and pasted it a bunch of times already? Now you’ve gotta go hunt down every single one you’ve copied and replace it. X position, and Y position for obvious reasons. This way, you can streamline your eventing process without having the need to finalize an event before mass producing it. This plugin lets you place text above the heads of various events using a miniature label through a comment tag. The text used can also use text codes so text, icons, colors, etc. whatever it is, you can use it as a label! 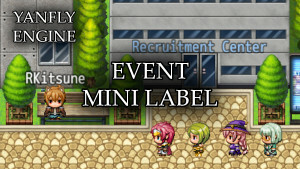 In RPG Maker MV, events can only activate when you are either standing next to them or on top of them. 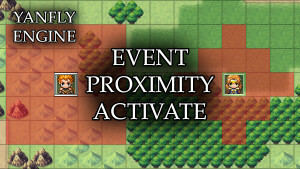 There is no activation proximity range that can be used to activate some events from afar. This plugin gives you multiple ways to activate certain events from a distance, through means of a square area around an event, a radius, row-centric, or column-centric. These new activation proximity ranges can be coupled with an event’s triggers: through the Action Button, Player Touch, Event Touch, Autorun, and Parallels giving multitudes of ways to activate events. And these can all be done by simply adding Comment Tags into an event page. 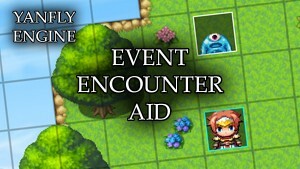 In RPG Maker MV, events can only trigger when you are either standing next to them or on top of them. This plugin lets you bind their activation to different events onto regions, making them trigger if the player is standing on the designated region first before talking to them through the Action Button, Player Touch, Event Touch, Autorun, and/or Parallels giving them multitudes of ways to trigger events. All of these can be done by simply adding Comment Tags into an event’s page. 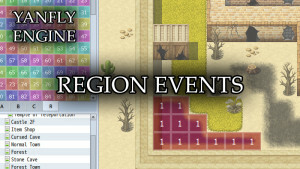 This is different from Region Events, which causes a Common Event to autorun once the player has stepped onto one of those regions. This plugin binds actual map events to regions instead. 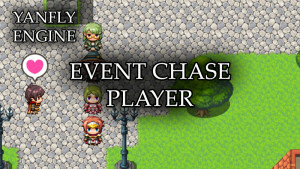 While in RPG Maker MV, there’s the ability to make events hidden and reveal themselves to make it look like they’ve spawned out of nothing. However, there isn’t an innate function to actually spawn an event from nothing. 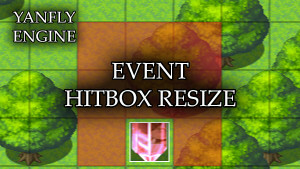 This plugin will provide users the ability to actually spawn an event that is premade and ready from another map(s). 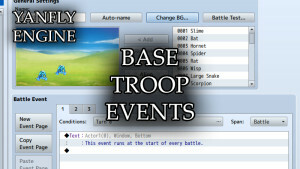 A spawned event will contain all the data from its original source, from the event’s page conditions to the event commands to the graphical settings. 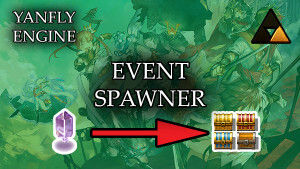 And should the original source be updated in the future, the spawned event will update as well. 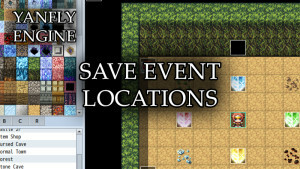 Spawned events can also be preserved and remain on the map if the player reenters the map or reloads a save. 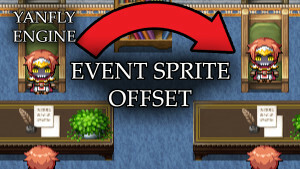 Events are bound to their tiles and their sprites are bound to their events. Naturally, this would mean that the sprites would be bound to the tiles, too, but sometimes, we’d like to offset the appearance of sprites so that they don’t look super uniform all of the time. This plugin gives you the ability to offset sprites visually using notetags comment tags. These plugins are made for utility purposes. 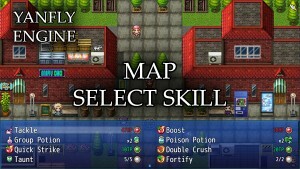 They don’t add to the gameplay, but instead, focus on making your life in using RPG Maker easier. 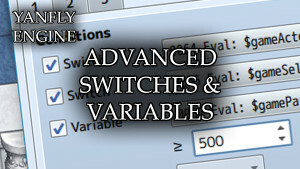 This plugin allows you to set switches that are either always enabled or always disabled based on a various conditions. These conditions are here to help enable easier access to determining the lesser frequently seen flags set by the game such as determining if the game is running via debug mode or on a certain type of browser. 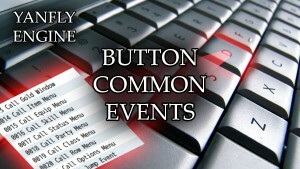 This plugin enables you to bind common events to the individual buttons on your keyboard. Instead of having the standard Z for OK and X for cancel, you can make other keys work differently. With the exception of important keys that shouldn't be altered, nearly full access is given across the span of the keyboard. This is a reproduced method from RPG Maker 2000 and RPG Maker 2003. 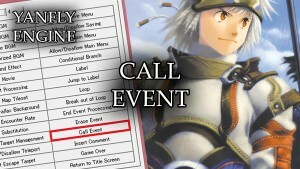 It allows the game to call a page’s events as if it were a common event. These events can be drawn from any event on any map within the game. 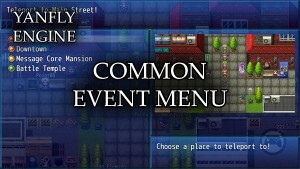 The Common Event Menu allows you to create your own custom menu setups. 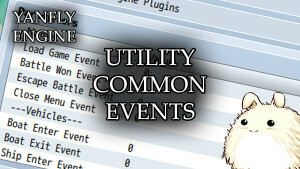 When using it, you can list whatever common events you so wish and generate a menu that when selecting the menu command, it will run the common event. This common event menu setup allows you to utilize a help window, a picture window, and a subtext window to allow for your own personal touch when using the common event window. This plugin adds a 'Credits' command to the title screen that will bring up a window of a credits page made the way you want. Text codes can be used for the credits page to allow for more customization options. Furthermore, specific entries can be tied to URL's so you can link back to those you've provided credit for! 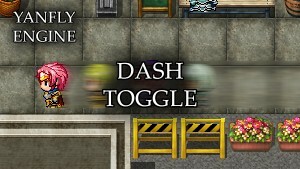 RPG Maker MV lacks the ability to toggle dashing on and off. 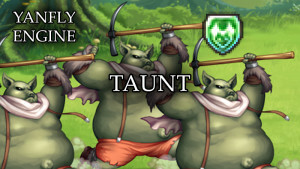 This plugin will enable you to toggle dashing on and off as well as provide certain traits that will inhibit the party leader from being able to dash (such as an extra heavy weapon). Add a way to access your website (or any) from within your game using this plugin! This plugin will also notify the player if the access attempt was also blocked. This plugin gives your player and/or events footsteps when they walk onto tiles. 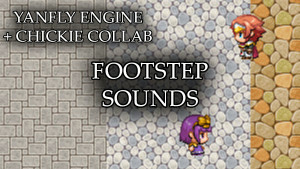 These footsteps made by players and/or events can have different sounds based on regions, tilesets, and/or terrain tags. If footsteps are enabled for events, they can have distance based volumes and pitches to immerse the player further. Sometimes there’s random jibber jabber that does not warrant a message box. 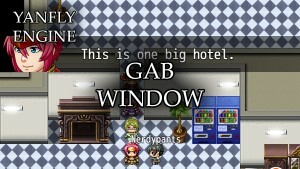 The Gab Window fulfills that jibber jabber by placing such text outside of the message window box and at the corner of the screen. The gab text will appear briefly and then disappear, not showing up again until the gab text is updated with something else. 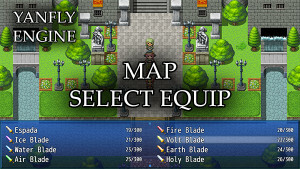 In RPG Maker MV, tilesets are used for mapping purposes. Tileset A is used for drawing land while Tilesets B through E are used to add doodads. 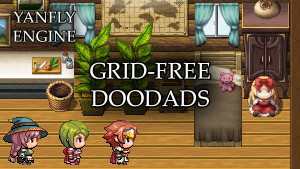 But in RPG Maker MV, doodads added by Tilesets B through E are locked to the grid and add a rather unnatural feel to it. This plugin will allow you to break free of the grid and add doodads unbound by the grid. Doodads can come in all forms, from large to small, static and animated, you name it! This plugin allows you to add more options to the settings menu in the doodads editor. This allows you to set the tone for doodads to change them into colors that hues will not allow, the option for doodads to appear under certain switch conditions, whether or not party members have joined. It’s not surprising for streamlined games nowadays to have their own help manuals included with the game or accessible within the game. 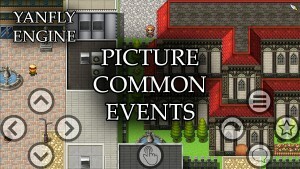 RPG Maker MV doesn’t provide anything like that by default, unfortunately. However, using this plugin, you can create ways to access the helpfile from within your game through either the F1 key or an in-game menu. 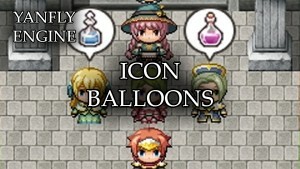 RPG Maker MV provides us with 15 Balloon Animations to use to allow our events to show emotions with. Sometimes, this just isn't enough. However, this plugin allows you to use icons from your IconSet to extend the number of balloon types you can use. This plugin allows players to change their keyboard configuration from the in-game Options menu provided that they're using a computer to play the game and not from a mobile device. 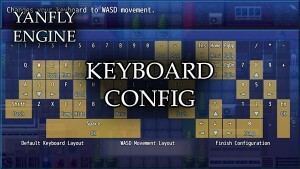 The "Keyboard Config" option will send the player to a different screen where they can assign actions to each of the allowed keys on the keyboard. 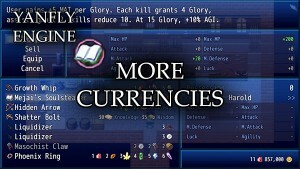 In RPG Maker MV, the main menu only shows the party's gold as the only currency in the game. However, some games would prefer to display more than just gold in the main menu, of which, may be possibly found in the form of variables. You can do so using this plugin! 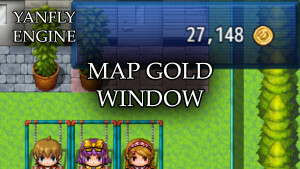 Ever wanted to display the gold window and leave it on the map screen for a bit? This plugin will allow you to do that with just a few plugin commands. 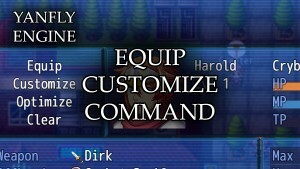 The Select Item event in RPG Maker MV does what it's supposed to: selects an item and then binds the value to a variable. 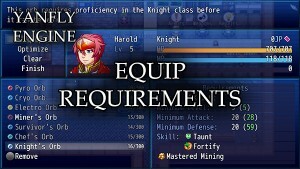 However, it lacks the ability to allow the player to select weapons, armors, or both. This plugin gives you the functionality of selecting an equip and binding the ID of the equip to a variable. 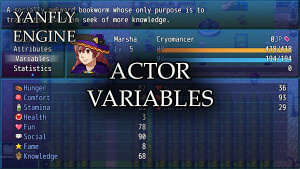 This plugin produces a window similar to that of the Select Item Window, but instead, it displays a list of skills from a designated actor and the skill type selected. When a skill is selected, it set the chosen variable's value to become that of the picked skill's ID. 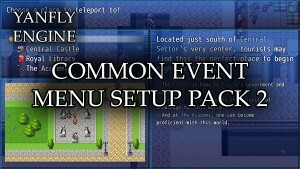 This plugin gives you (as the developer) access through plugin commands to opening the party’s status menu on the main map screen, as it is usually seen from the battle system. 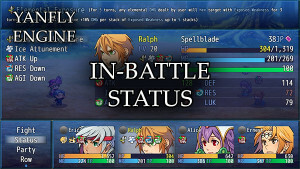 It will display everything the normal battle status menu usually has and it can also be moved. This plugin adds a new menu that you can send the player into. 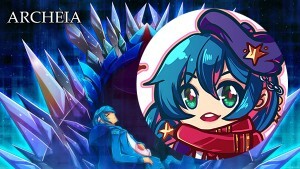 In it, the player will be able to play any songs previously encountered within the game that you allow them to be able to play. You can set the filename, display name of the song, the volume, pitch, pan, and even the help description for when the song will be replayed. Pictures can function as something other than just a visual for your game. They can sometimes serve as UI elements or more! However, what they don’t have the ability to inherently do is to call upon common events when clicked on by the mouse. With this plugin, the pictures bound to a common event will become usable when clicked or touched! 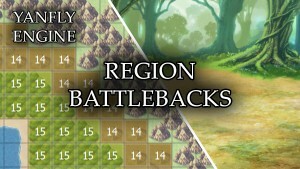 This plugin will allow you to alter the battlebacks used by default for the overworld in addition to bind specific battlebacks to specific tiles on the map through usage of regions. Apply common events to specified regions! 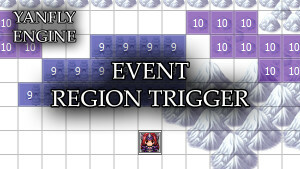 Simply by stepping on a tile marked by that region will trigger a specific common event! Don’t like having NPC’s wandering into places they don’t belong? Feel like the player shouldn’t have access to certain parts of the map? 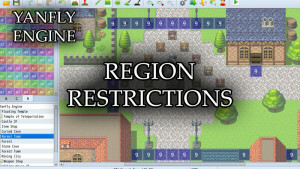 The Region Restrictions plugin lets you do just that by simply planting regions onto the map to prevent those nosy events from going to places they shouldn’t. This plugin expands region restrictions (and allowed regions) to vehicles. On top of that, you can designate specific regions for vehicles to land in. This way, you can make it so that small boats cannot traverse certain bodies of water, land in only certain spots, etc. that ships can or vice versa! Add a bit more variety to the way vehicles are handled for your game! 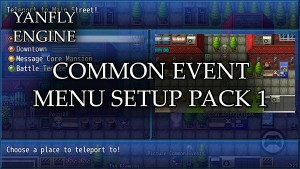 In RPG Maker MV, you can either choose to enable encounters or disable them completely. However, making a system that repels encounters for a certain amount of steps or increase the encounter rate for a certain amount of steps is a whole different matter. 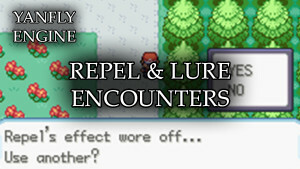 This plugin allows you to create ways to repel encounters, generate lures, and the rate at which lures are done. 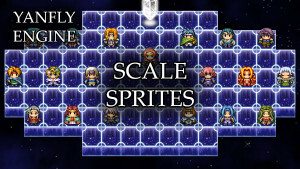 Sometimes we want to use sprites from different sizes other than 48×48 for our standard sprites. But sometimes, we’d also like to scale them from the actual size they’re at, too. For example, if your sprite would be 128×128 tall and you want it to appear 48×48 in-game, this plugin will let that effect happen. 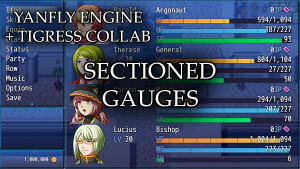 Sections are divided up into percentile parts of the gauge allowing for the player to easily read the percentile value of an HP, MP, or TP gauge. Plain old gauges can be kind of hard to read when they're a bit too long. Make them more visually friendly by sectioning them up so the player has a better idea of how much of a battler's HP, MP, or TP is left. You can set how many sections you want for the gauges, too. 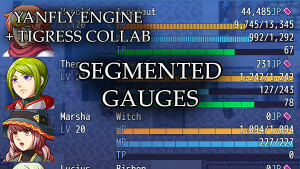 Segments are divided up depending on a specific flat value amount, allowing for the player to guess the exact value of an HP, MP, or TP gauge. This is because normally, gauges can be kind of hard to read when they're a bit too long. Make them more visually friendly by segmenting them up so the player has a better idea of how much of a battler's HP, MP, or TP is left. You can set much value will be used per segment, too. This is a collaboration plugin by Tigress and Yanfly to ensure compatibility with the Yanfly Engine Plugins library and with special thanks to Fragrarch for an idea on how to approach this. 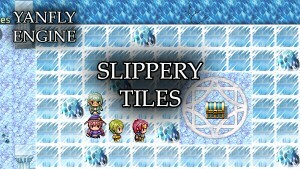 This plugin enables you to set which tiles are slippery tiles through either regions or notetags. To use regions, change the parameter setting to which region ID you would like to associate with a slippery tile. For those that may have made their own Jump system before with events, you may have come across the problem of being able to jump off the map, into places you're not supposed to go, or even on top of events that shouldn't be allowed to go on top of. 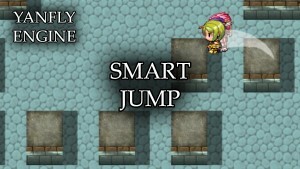 This plugin helps faciliate eventing a Jump system for your RPG Maker game by introducing Smart Jumps. 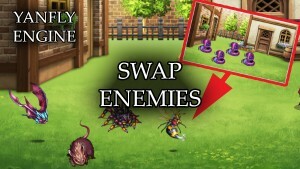 This plugin allows you to have an enemy be a basic randomizing swap dummy for other enemies. 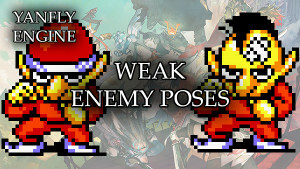 Insert enemy ID’s of other enemies inside of the swap notetag and those enemies will take place of the swap monster at the start of a battle. 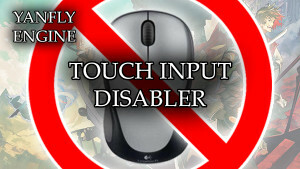 Sometimes, we just want to disable the mouse and touch controls for our games. This small plugin lets you control just which parts of the mouse and touch controls you want to disable out of everything available. Everything related to the mouse/touch input is disabled by the default plugin parameters. Change the settings to fit your game. If a setting is on/true, then the mouse/touch input for that setting will be enabled. Sometimes, we’d like a little bit more control over the kinds of things that occur during certain aspects of our RPG Maker projects. What could have been easily done through common events is made more difficult because there are no proper triggers to activate those common events. This plugin enables certain triggers to occur from loading a game, winning a battle, escaping a battle, and more. Enable DragonBones to work with MV! 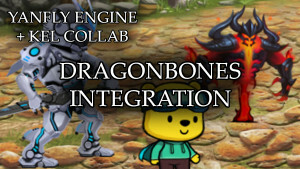 DragonBones allows your games to use skeletal animation, a type of computer animation in which a character (or object) is represented by skins/textures and a digital set of interconnected bones (called the skeleton). Using a set of instructions, the game will create animations based off these skins, skeletons, and instructions to create beautifully smooth and light-weight movements. This plugin, made by TheGreenKel, and collaborated with Yanfly, will allow you to use skeletal animations made by DragonBones for your battle system! This means that with skeletal animation, you can make your battles look extremely fluid, more flexible animations outside of only 3 frames per motion, more than 18 possible motions, get rid of sprite based resources for faster loading times, and smaller file sizes for your games! In other words, there's practically no drawback to using it provided you have the resources. This is a collaboration plugin by TheGreenKel and Yanfly to ensure compatibility with the Yanfly Engine Plugins library. These are various plugins with miscellaneous effects on the game. Note: Some of these do not have a video attached. This is because some of these are snippets and will be expanded upon more later or already have a more expanded version above. Gamepad Config – Allows your players to config their gamepads from the Options menu. 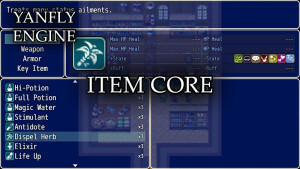 ItemBook v1.01 – Originally provided by Ojima with the RPG Maker MV package, this one contains an update that makes it compatible with YEP Item Core. Screen Resolution – Change your game’s screen resolution if you don’t want to use the Core Engine. And that’s all, folks! Happy RPG Making!